Posted on June 14, 2018 by thelostlighthouse	in Comics, Literature and tagged Asgard, Christian Ward, comics, comics reviews, God of Thunder, Jane Foster, Jason Aaron, Literature, Marco D'Alfonso, Marvel, Marvel comics, Mike del Mundo, Odinson, superhero, superhero comics, Thor, TLL, VC's Joe Sabino. 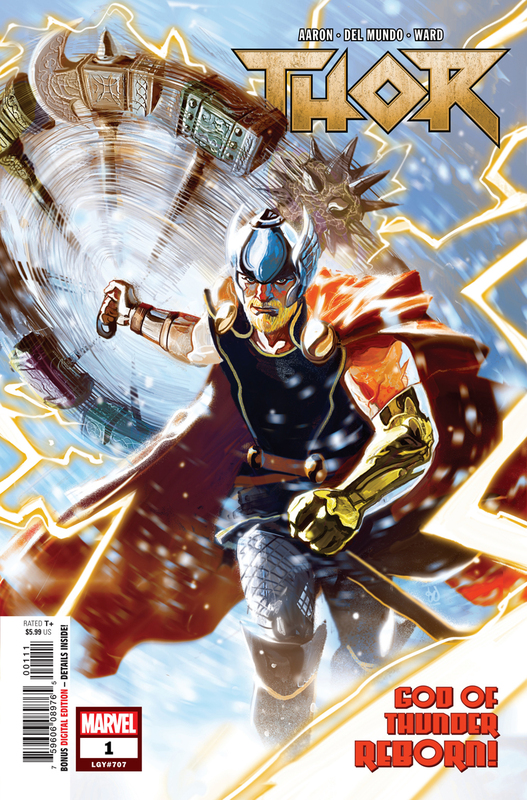 This week I read Thor #1 from Marvel Comics, the latest relaunch for the God of Thunder under Jason Aaron. 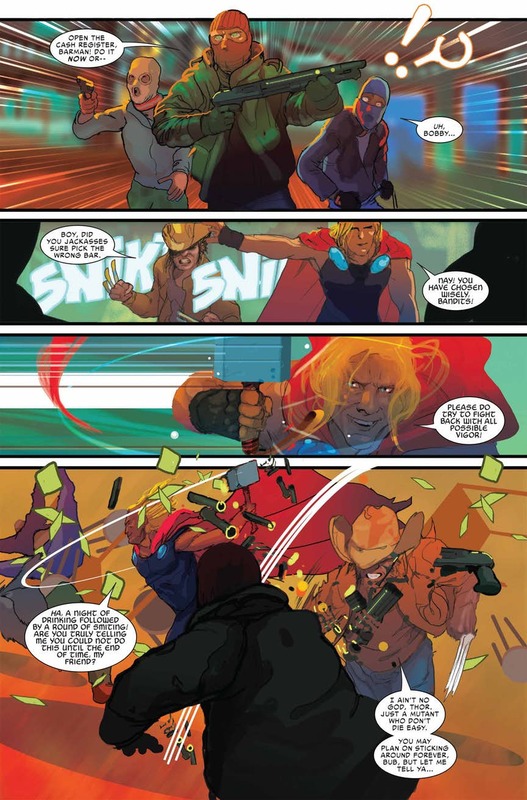 Mike del Mundo provided art for part one, ‘God of Thunder Reborn’, with colour assists from Marco D’Alfonso, and Christian Ward drew part two ‘The Grace of Thor’, with letters on both by VC’s Joe Sabino. The Mighty Thor is dead. Long live Thor. In ‘God of Thunder Reborn’, after the defeat of Mangog and the destruction of both the hammer Mjolnir and Asgardia, Jane Foster has reluctantly stepped down as Thor to finally focus on the treatment she needs for her cancer. The Odinson has taken up his old mantle again, with a fancy new golden arm and a lot of hammers, and with Jane’s direction he is tracking down displaced Asgardian artefacts before they fall into the wrong hands. Meanwhile, the bifrost is under repair, and until it is fixed there is no way of accessing other realms – a big problem, as Malekith the Accursed wages his War of Realms and Thor is powerless to stop it. In the second story, ‘The Grace of Thor’, a one eyed old Thor and his grand daughters are watching over a rebooted Midgard. After all life ended on the planet long ago, now over 200 years have passed since they seeded life there once again in the forms of ‘Jane’ and ‘Steve’. As Jane dies, Thor sombrely reveals the state of the afterlife, before flying to the edge of the universe, which is rapidly ending. And there he meets the final incarnation of the Phoenix. I hope Jason Aaron keeps writing Thor comics for a good long time yet, regardless of who Thor actually is. The arc of Jane Foster as Thor was wonderful, and enjoyed a satisfying wrap up too while not ending her story within this world. The Odinson slipping back into being Thor seems effortless, but to maintain his God of Thunder status he seems to be effectively supported by his own version of MI6, with Jane filling the role of M, and Odin and Screwbeard outfitting him with gadgets and magics in place of Q. It means that the usual brawns over brains approach needs to be taken with an element of improvisation rarely seen from this Thor. Aaron’s script is excellent, unsurprising as these are characters he has been in charge of for years now, but the new status quo of Thor and his supporting cast is still fitting in to the ongoing narrative of the plot he has been driving for a while now. Mike del Mundo’s art is otherworldly, and yet feels very at place here. I feel that he is even better placed on Thor than his recent run on Avengers. There are some stellar action scenes in ‘God of Thunder Reborn’, but the quiet moments in the Brooklyn resettlement of Asgardian refugees works very well too, bolstered by the warm colours that often accompany del Mundo’s pages. For ‘The Grace of Thor’, Christian Ward’s skills are perfectly suited to the grand space sequences on display, from fighting a space shark to speeding to the universe’s end, and these pages are awash with cleaner colours than the first part that suits the story just as well. Rather than feeling jarring having two stories in one issue, the two artists sync right up with their respective tales, enabling them to complement each other. To say Thor #1 is a great start would be disingenuous and a disservice to all that came before it from Aaron and the other great artists who have shaped his run on Thor. More this is a great continuation that may serve as a jumping on point for anyone who has slept on the series up until now (but if you have you should absolutely go back and read it all in trades). I’ll miss the Goddess of Thunder, but I suspect that we haven’t seen the last of her. Regardless, get this at your local comic book shop or online! Posted on January 18, 2018 by thelostlighthouse	in Comics, Literature and tagged art, comic book review, comic books, Jane Foster, Jason Aaron, Literature, Marvel, Marvel comics, Matthew Wilson, Odinson, Russell Dauterman, superhero comics, superheroes, The Might Thor, Thor, TLL, VC's Joe Sabino. Dauterman and Wilson’s art has to juggle two tones of story – one where Jane is battling cancer and facing the decision of her life and one where the Mangog tears through Asgard. To me, they handle this well, with duller tones during the Jane Foster focused panels and vibrant bright tones in Asgard. The Mangog is very, well, orange and is a villain who could easily look a bit ridiculous if handled incorrectly, but I think the artists do a great job in portraying how terrifying it must be to stand up against. I also very much enjoyed Sabino’s lettering, and the panel breaking screams during the battle between Asgardians and the Mangog. The build up to the finale for The Mighty Thor is showing a lot of promise, Jane’s characterisation and how caught she feels between her two lives is very compelling. While I don’t want to see the Mighty Thor go, this run of comics has been successful and in both Marvel and DC characters do happen to have a habit of coming back… like the one who gets a cameo on the final page! Posted on August 24, 2017 by thelostlighthouse	in Comics, Literature and tagged apocalypse, comics, comics reviews, Jane Foster, Jason Aaron, Jordie Bellaire, Literature, Mahmud Asrar, Marvel, Marvel comics, Marvel Generations, Marvel Legacy, Odin, Odinson, superhero, superhero comics, The Might Thor, The Thunder, Thor, TLL. While Marvel wraps up their current event, Secret Empire, they are already laying the groundwork for their next event, Marvel Legacy, that will apparently smash together classic characters and their more recent legacy counterparts into a new status quo. This starts with the Generations one-shots, where the current and classic versions of several of Marvel’s most recognisable characters team up for a short adventure. My first foray into this is The Thunder, written by Jason Aaron and drawn by Mahmud Asrar, with colours by Jordie Bellaire and letters from VC’s Joe Sabino. 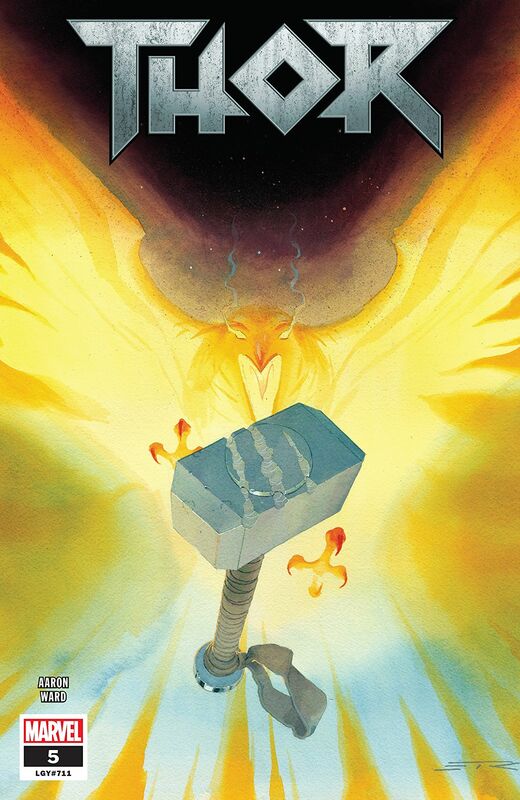 The Thunder, you may be able to guess, is a Thor-centric comic starring The Mighty Thor Jane Foster, who is the current wielder of Mjolnir and Goddess of Thunder, and The Unworthy Thor, who is the Odinson without the hammer. But not the current Odinson (recently star of a comic called The Unworthy Thor), instead this is Thor before he could ever wield Mjolnir but is still called Thor. It’s confusing. Odin chastises his son for trying to lift such a dangerous weapon again, and summons him to greet some guests in the great halls of Asgard. But Thor, answering prayers from a group of Vikings set on invading Egypt, speeds off on goat-back to aide his faithful. There he finds Apocalypse, and has quite the fight on his hands. Until a time-displaced Jane Foster arrives to help out. After a little confusion, the pair waste little time in bringing the thunder. Jason Aaron has been writing Thor (both Odinson and Jane Foster) for a while now, and continues to surprise, especially in how much variation he brings to the various levels of youthful arrogance the Odinson has over the millennia. And the pair are both reminded of what is key to any Thor, and that is humanity. The Thunder is incredibly fun, which is what these Generations books should be aiming for. 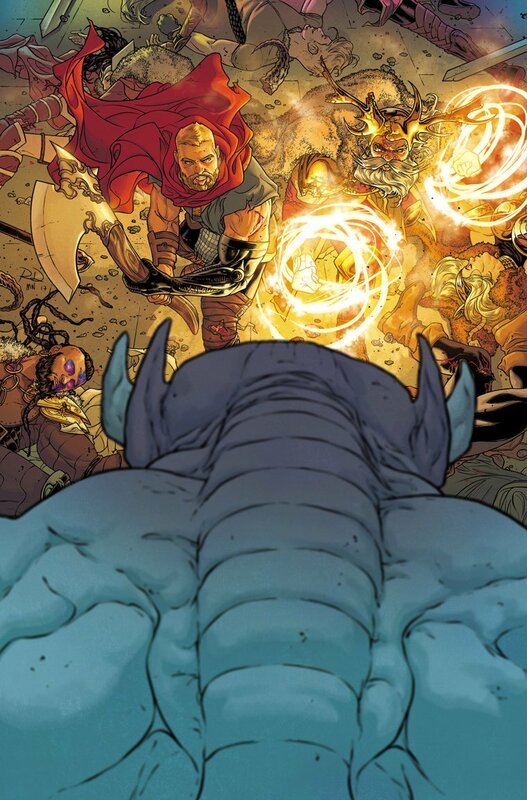 As for the mystery of why Jane Foster was thrust back in time, or those final pages with Odin? I think we will find out in Legacy, and perhaps what The Vanishing Point is at the end of Secret Empire. At least this year’s event isn’t overrunning and hanging over the ongoing state of the Marvel Universe quite so much as last year’s Civil War II. Key to Aaron’s enormous success to date with writing Thor comics is being paired up with artists who deliver on his vision and make the gods of thunder seem real. Mahmud Asrar draws jaw-dropping action worthy of those who have come before, and the splash pages are gorgeous to behold. Jodie Bellaire as usual brings colours in that only make the art better, with the lightning almost jumping off the page. I have no idea where Legacy or the Marvel Universe is currently headed, but if it as fun as The Thunder then I can’t wait. Posted on December 8, 2016 by thelostlighthouse	in Comics, Literature and tagged comic book reviews, comic books, comics, Jason Aaron, Literature, Marvel, Marvel comics, Matthew Wilson, Odinson, Olivier Coipel, The Unworthy Thor, Thor, TLL. ​Our pal Kit reviews comics for us! This is one of those reviews. If I’m honest I feel Marvel have been underperforming across many of their comics, however the ongoing situation with the Thor characters, specifically Thor and Odinson has been something Marvel have been keeping up to their normal high standards on. As with all comic book de-powerings/incapacitations/deaths etc. Odinson will of course regain the mantle of Thor eventually, though I’m expecting him to share it with the current Thor once he’s worthy once again. The current Unworthy Thor series is certainly indicating this will both be the case, and his story of redemption. The story picks up with the Odinson and Beta Ray Bill teaming up, to set out and find a supposed extra hammer (read the very good Thors series, part of Battleworld last year). Their deep friendship conveyed in the respect Bill still shows Odinson in the opening panels really stood out and kicked this issue off to an excellent start. The issue also contains a particularly good dream sequence where we get a snapshot of Odinson’s current psyche. One panel in particular stands out for showing Odinson’s current relationship with his hammer, the weight of the situation is crushing him and he’s helpless beneath it. We’re also introduced to the first villain of the story as well, The Collector. As an adversary he has a unique drive and motivation to all of his schemes, which sets him apart from your standard comic book villain. Can Coipel draw hands? The number of hands on show are limited throughout the issue. Due to the large scale of the combat they’re usually small during the fight scenes and during the conversations the emphasis is so often on character’s faces as opposed to their whole body language. Hands are drawn perfectly well when they are shown, unfortunately this is less often than I’d like to see during conversation, though only because they can add to personality so effectively. 7/10 for hand drawing skills! Aaron is off to a great start with what could well be a fantastic redemption story. The twist villain at the end promises to up the ante throughout the series and the artists are certainly giving it the high standard it deserves. Posted on November 3, 2016 by thelostlighthouse	in Uncategorized and tagged comics, comics reviews, Jason Aaron, Joe Sabino, Literature, Marvel, Marvel comics, Marvel NOW!, Matthew Wilson, Mighty Thor, Nick Fury, Odinson, Olivier Coipel, Original Sin, Secret Wars, The Lost Lighthouse, The Unworthy Thor, Thor, Thors, TLL. This week I picked up The Unworthy Thor #1, the start of a new miniseries starring the Odinson as part of the Marvel NOW! initiative. 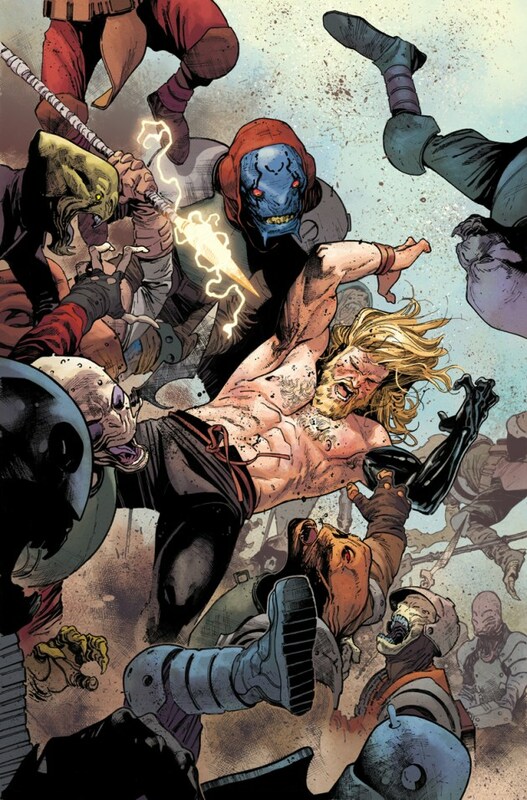 The Unworthy Thor was written by long time Thor writer (and writer of the current Mighty Thor series) Jason Aaron, with art by Olivier Coipel, colours by Matthew Wilson and letters from VC’s Joe Sabino. Two years ago in the Original Sin event, Nick Fury whispered a secret into Thor’s ear that caused him to become unworthy to wield the hammer Mjolnir, dropping the weapon on the surface of the Moon unable to lift it again. Since then, Mjolnir has been wielded by Jane Foster, taking the Odinson’s place as Thor and doing a damn good job of it. But what of the Odinson? Things haven’t been going well for him. He lost his hammer. He lost his arm (he did get a fancy new one though). But now, in the wake of last year’s Secret Wars, there is a new Mjolnir in the regular Marvel Universe, and the ex-Thor is determined to find it. Jason Aaron has been writing this character for a long time now, and it’s very clear that he know exactly how the Odinson thinks and why he works so well when written well. Marvel do have a recent issue with holding out on a secret or plot point a little too long before the reveal (looking at you Cyclops post-Secret Wars), and the mystery of what Fury said to Thor has been held onto for so long now it is in danger of being underwhelming regardless of the gravity when it is finally revealed. However, the writing in all of Aaron’s various Thor comics since has been so strong that it is easy to forgive this point and just enjoy the story as it comes. The Unworthy Thor is no exception, with plenty of mystery and action, along with the return of a fan-favourite character. Coipel’s art, probably better called ‘The Shirtless Adventures of the Odinson’, is hugely detailed and brims with a sense of the epic, and be it in the desolation of outer space or in the brutal brawls throughout the book there aren’t many artists better suited to this series. And he draws a damn impressive goat. I’ve extolled the virtues of Wilson’s colours multiple times before, but it does bear repeating. His colours bring an extra level of vibrancy to an already great looking issue, with the scenes on the Moon and in space looking colder, and the action beefier because of them. The Unworthy Thor #1 is a great companion to the superb Mighty Thor, with gorgeous art and an interesting set up that promises a lot for the future of the Odinson and his corner of the Marvel Universe. I’m hoping that we do finally find out the reason for the unworthiness, but even if we just get a good Thor story out of it that would be fine too! Check it out at your local comic shop or digitally now. Check out the recent collected stories that lead into The Unworthy Thor, and support the site by picking them up through our Amazon links! 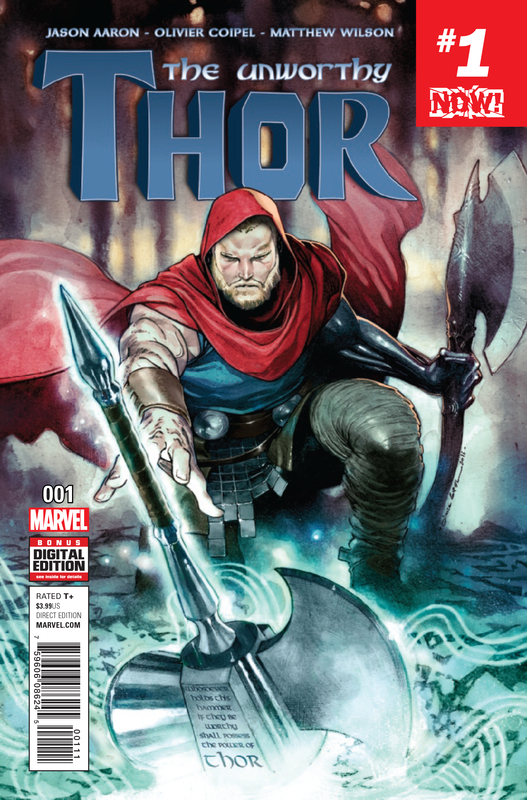 Thor becomes unworthy in Original Sin; a new Thor picks up the hammer in Thor: The Goddess of Thunder & Who Holds the Hammer? 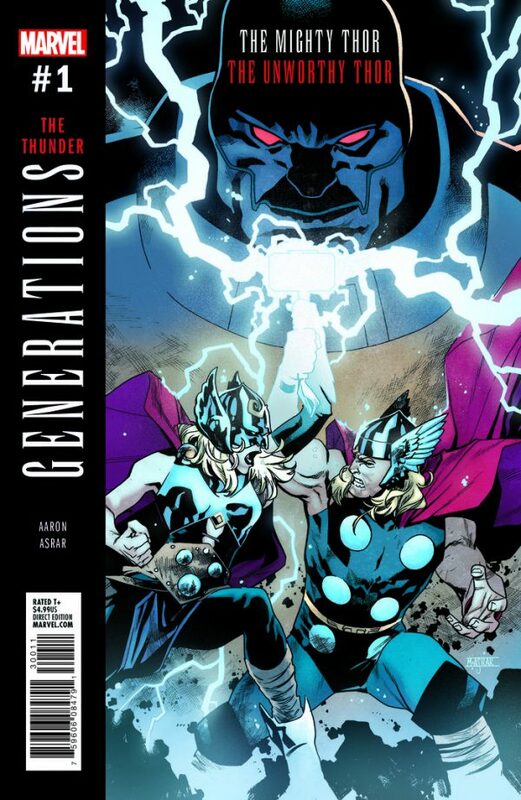 ; the Marvel Universe collides with the Ultimate Universe, and a new Mjolnir appears as a result in Secret Wars and Thors; and Jane Foster continues her adventures post-Secret Wars in the first volume of Mighty Thor: Thunder in her Veins.